‘I happened to be Mrs. Jackson Pollack…I was a woman, Jewish, a widow, a damn good painter, thank you, and a little too independent”. Lee Krasner, fiery thinker and key Abstract Expressionist who connected early twentieth-century art with post-war America. Krasner had studied in the 1930’s under influential painter Hans Hoffman, becoming skilled in technique and art theory, which along with a wide knowledge of modern art, she later came to share with her husband Jackson Pollack. It was Krasner who developed the “all over” technique, which became a key element in Pollack’s famous drip paintings. Krasner was a social and ambitious creature, connected to the most influential artists, critics and collectors of her time. 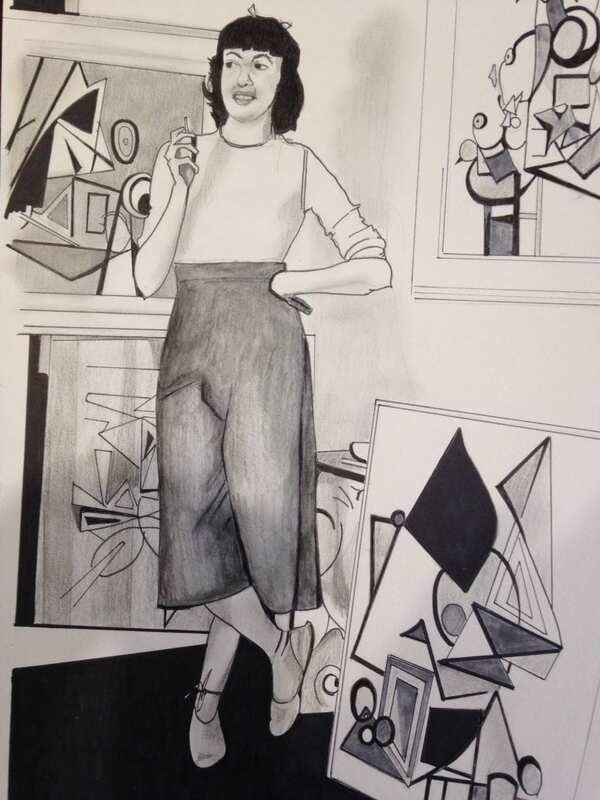 This included the fabulously eccentric and wealthy collector Peggy Guggenheim, critic Clement Greenberg, whose theories she helped early to shape, and star painter Willem de Kooning. Strongly protective of Pollack, she nevertheless made sure he was part of their world. Amongst Krasners’ peers were a number of other talented and fiercely independent artists who were women. Joan Mitchell (who like Krasner did not suffer fools gladly) Perle Fine, Grace Hartigan, Corrine West, Helen Frankenthaler and Elaine de Kooning. Yet despite a spirited self-belief, many resorted to strategies to navigate the discrimination they encountered. Krasner would sign her paintings with her initials so they were genderless, to escape being seen as a woman, or the wife of another painter. Corrine West decided in agreement with her lover Arshile Gorky to sign her works ‘Michael’ West, and Grace Hartigan, though championed by Willem de Kooning, in the early 1950’s went as ‘George’ Hartigan to gain recognition. Krasner had always been a staunch champion of Pollack despite having to endure his depression, spiraling alcoholism and affairs. After Jackson Pollack’s death in a car crash in 1956, from the 1960’s onwards Krasner began to emerge from behind the shadow of her world famous husband. The 1978 exhibition, “Abstract Expressionism: The Formative Years” inserted Krasner rightfully and historically along side Pollack, Willem de Kooning, Mark Rothko, Barnett Newman and Robert Motherwell. At the unveiling of the new Whitney Museum in 2015, with its much-anticipated exhibition, “America is Hard to See, “ one could take the elevator up to the seventh floor to the main room dedicated to Abstract Expressionism. One would discover on entry, head on, Lee Krasner’s beautifully successful painting ‘The Seasons,” from 1957. Flanked to her left on a wall, and positioned so one would have to make the effort to turn to look at it, was Willem de Kooning’s “Women and Bicycle,” 1952-1953.